This morning at Paris Haute Couture fashion week Chanel has given a master-class in extravagant quaintness beauty. The catwalk was a triumph of Gothic meets Nineteenth Century make-up and hair-dos, beautifully crafted and elegantly worn by a storm of models led by the stunning Cara Delavigne. 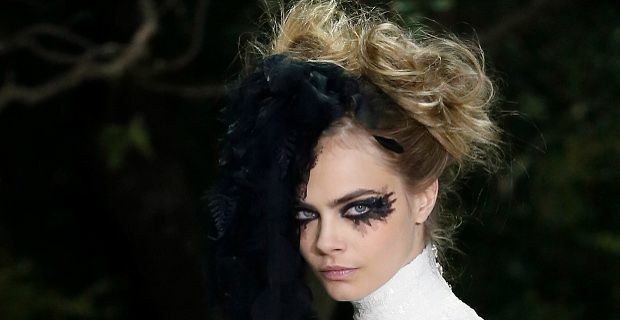 The 22-year old British model was sporting a seemingly care-free up-do, that interplayed in details, featuring black lace and a feathered veil with added particulars. The decadent, yet elegant and exaggerated hair-style was created by Sam McKnight and individually made to complement each model's face. The hair-piece came in monochrome shades, enriched with small, sometimes colourful details. The hair were parted on one side and put up in small back-combed buns, topknots or plaits, which created a sort of organised but messy hair-do. The hair were clean, but had a matte velvety texture that suited the rich fabrics of the clothes. Feathers are set to make a big come back and for what we have seen, lace is here to stay. The make-up was absolutely genius, the models looked like Gothic brides out of one of Tim Burton's movie, with a Clockwork Orange punk interpretation. Natural complexion was brought to life by a subtle hint of rose blush on the cheeks and pink iridescent lipstick. The focal point, though were the eyes, black, bold and beautiful. The classic smoky eye was skilfully smudged to perfection, creating a complex design around the lower eyelid and external corner, which seems to elongate and add texture to the eye-lashes. To create that Gothic vibe, irregularly cut black lace was applied around the lower part and external corner of the eye, on top of the black kohl. Lots of black mascara was added to create fuller lashes. The Chanel Spring Summer 2013 make-up is not an everyday look, but will certainly add drama to a chic haute couture gown.